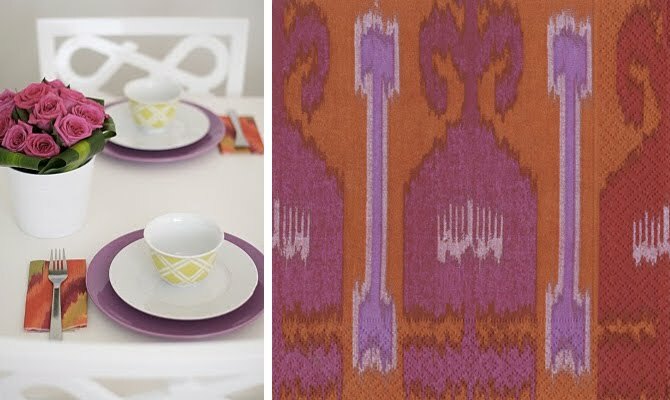 Ever since Caitlin posted pictures of her home from the Emirates Home shoot, I've been dreaming of those pretty ikat napkins on the table. Between the elegant pattern and the spicy colors, they instantly dress up a neutral background. And since I'm all about neutrals with pops of color, I've been on the hunt for something similar ever since. Yesterday, at a local grocery store, I spotted inexpensive, paper napkins that are a close resemblance to those on Caitlin's table...thrilling! (you can find them online here). Any of the 3 available colorways would be stunning additions to your next dinner party or casual gathering with friends. Those are truly clever, I love them!